My house smells like vanilla: Table decorated! 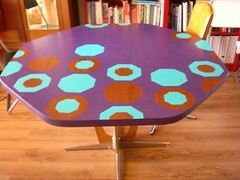 Way too long ago to be 'fessing up here (it's more than 6 months) I commissioned my friend Eve from Atom and Eve to make some decals for a weird table I got in an op shop a couple of years ago. 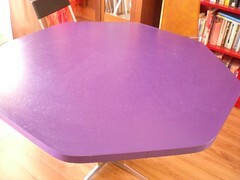 It was white formica and I painted it purple originally and while it was an AWESOME colour, a paint mishap (crap formulation - product recalled after I'd painted of course!) meant the finish was less than awesome. 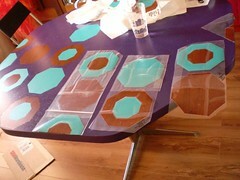 So I discussed with Eve how to make some octagons to suit the table. She was easy to work with and had some great ideas. I went with turquiose and wood grain and they arrived pre packaged for me, numbered and everything! All I had to do was take the backing off and apply. 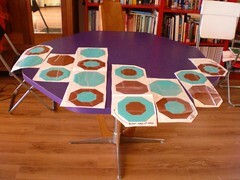 Some of them needed trimming to fit of course! Why would I want to do that? ?